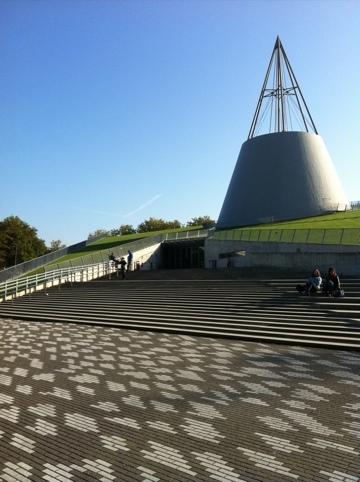 TU Delft Library and Learning Centre is the bright shiny new facility at the university located on outer rim of the city for the students. 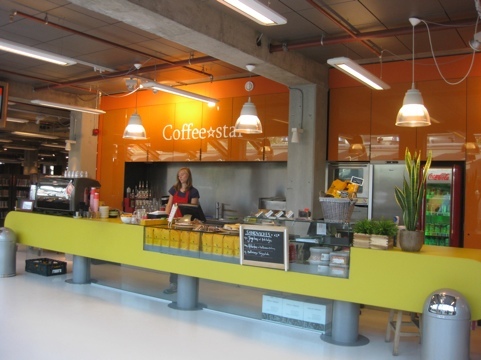 DOK: Library Concept Centre is in the heart of the Delft shopping and community precinct for the broad community of the city. Both of these places are transforming the traditional understanding of the library, the place where books are kept and be a place where people can come, work, play, connect and, of course, find information. 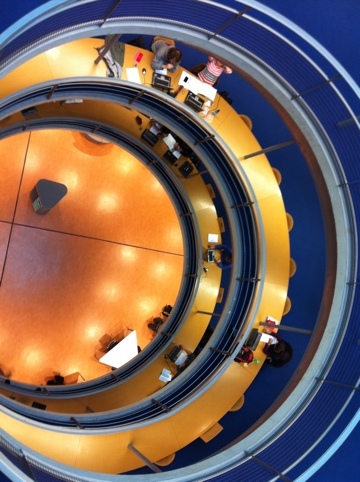 As one of our group observed, TU Delft Library is a great place to go online. 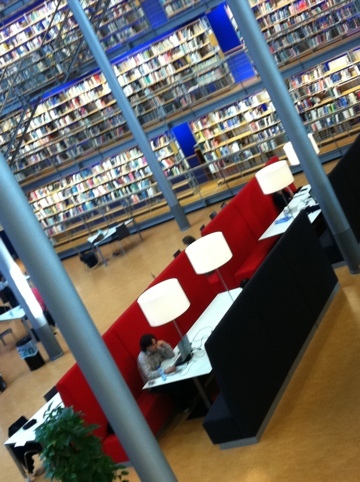 The library has books – is this the defining characteristic of libraries? 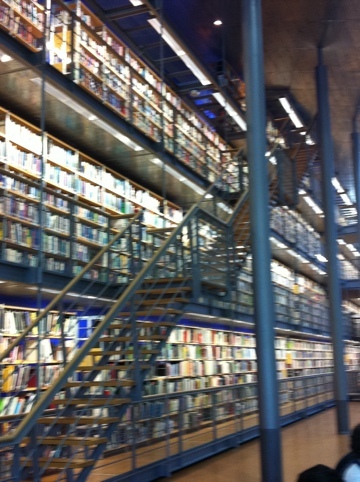 The books are located on four levels, double-sided shelves along the length and the breadth of the longest wall. While accessible the wall feels like a distinctive artwork. 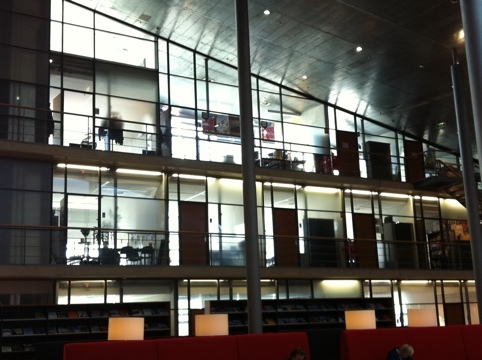 From the outside, the library has striking architecture. Glass walled on three sides, with a grass slope up the side of the entrance. The structure perched on top looks like a rocket ship coming up through the top. 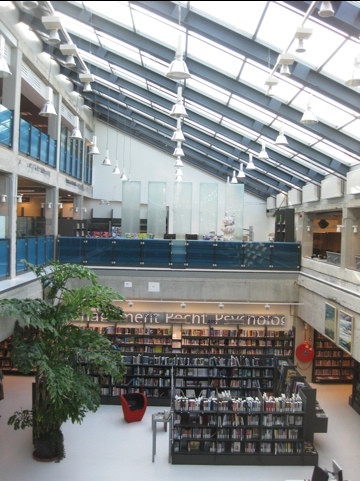 The interior of the grassed roof provides a sloping cathedral ceiling, and inside, the rocket ship base provides three levels of working spaces, directly accessible to the upper levels of the shelves via a bridge. On the morning we were there about 500 people were making use of the entire space, About 2% were either at the book shelves or looking at books, the vast majority were at their computers, working alone and others in the meeting rooms, working with peers. Each of the breakout rooms can be booked for a fee and must be used by three or more people. These room are furnished with desks and chairs and interesting pieces of furniture. One wall in each room has full size inspiring quotes and pictures. 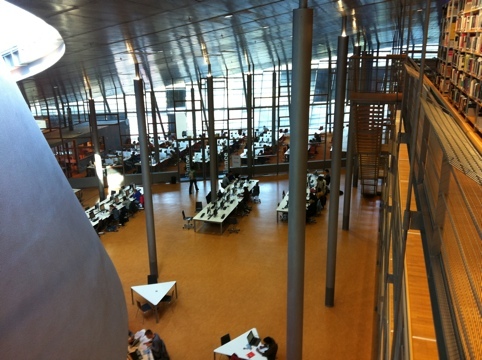 The second library was DOK: Library Concept Center in the centre of the community precinct. While books seem to be the distinctive feature that identifies a library, this community facility has so much more to offer. It is a place in and for the community. The people at DOK have identified what sets them apart from other sources of information, and that is the local distinctive. They are able to source local information and services that meet a need of their stakeholders. What would the community like DOK to do or provide for them? Not just what DOK thinks the community needs. 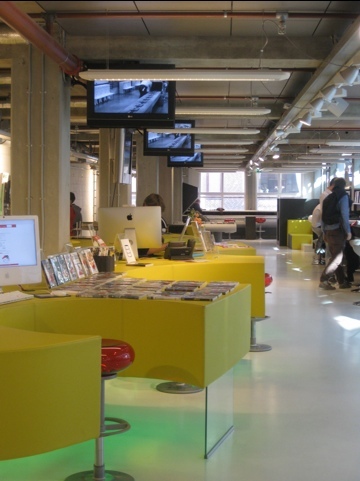 Libraries in The Netherlands are in a difficult position, they aren’t funded by the city, but through subscriptions, which means DOK needs to be realistic about what finding out will bring the community in, rather than assuming what they need. 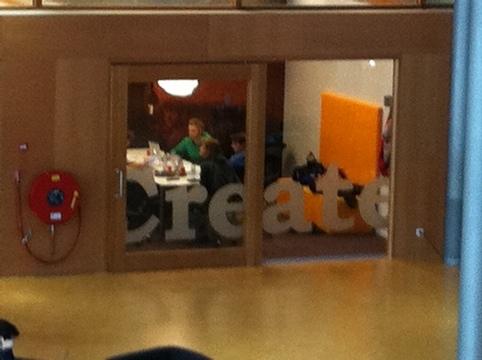 There are lots of places to read, lots of options to view, listen and generally engage with content. I asked Mark about the future role of the library as book repository. He seems to think that libraries with shelves and shelves of books really only have two or three years left. What then? It’s probably time to get thinking about this and asking the questions? What content do our users need? What is the most effective way to provide the content? How can we better deliver that content? What do our stakeholders need? 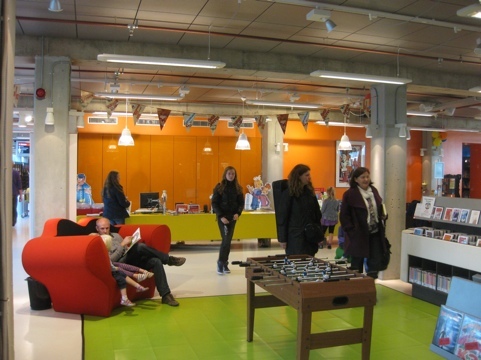 People need a place and an important role that libraries perform is providing that place for people to come be comfortable, to learn, engage, be entertained and be with other people. 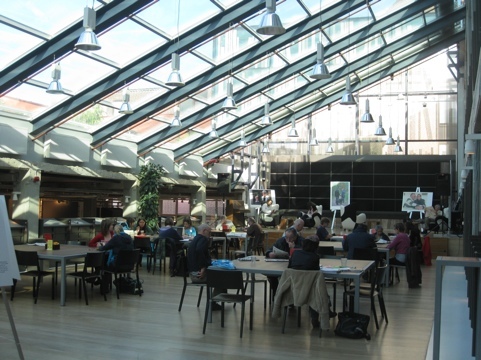 What if ‘libraries’ became the after-school/work or recreational spaces for the whole community – just like what we saw Baune in Copenhagen was providing for children? If Mark at DOK believes Books on shelves have 2-3 years, then In reality, the community needs to own these spaces as information providers and places for cultural exchange. If libraries have historically provided the latest release books, or titles in a whole series for free to the community, and for the users find the information they need, then what will be the 21st equivalents? Digitally, providing the place for the community who don’t have their own computer, a bit like providing the latest books that people don’t need to buy. What I found refreshing about DOK was that they were asking the relevant questions about the future, their financial situations forced them to reinvent. Perhaps if they were guaranteed funding from the city they would be ‘business as usual’ but, challenges are usually the best place for creativity and innovation to emerge.